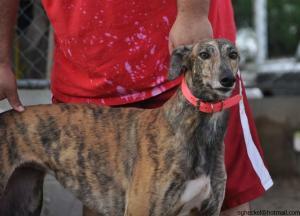 Ramona is a brindle girl that just arrived from the Jacksonville track. We got her because she was a littermate to Cheyenne Paula, another dog we adopted out. She turned 4 on June 1st and tested cat trainable at the track. She raced at 60lbs and her sire is the famous Dodgem By Design so she is a half sister to a bunch of other dogs we have placed. Her dam is Payday Pet. Ramona is described as friendly, sweet and playful.